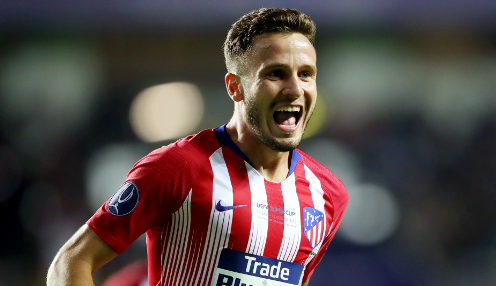 Atletico Madrid midfielder Saul Niguez is confident that his side will improve on the performances they have given in their two La Liga games this season. Los Colchoneros began their campaign with a 4-2 European Super Cup triumph over city rivals Real, but have been below-par in their following two matches. We believe we will continue to improve and our quality will shine through. Their league opener saw them draw 1-1 at Valencia, while on Saturday they edged a 1-0 victory at home to Rayo Vallecano, with Antoine Griezmann scoring the only goal of the game. However, Spain international Saul says there is no reason for concern, with the Atleti squad continuing a number of players who are still recovering from their exertions at World Cup 2018 earlier in the summer. He told Marca: "We are not thinking about what people outside of the club are saying and ignoring any expectations. "Every game has lots of complications and for us it has not been an easy pre-season with players returning - we are not yet at our top level. "We do have plenty of self-belief and we will continue to work hard and fight for everything, we believe we will continue to improve and our quality will shine through." Next up for Atleti is a trip to Galicia to take on Celta Vigo next Saturday, with the hosts having lost their last six La Liga meetings with the men from Madrid. Los Rojiblancos are 3/4 to secure victory at the Balaidos and are 13/2 to claim a 2-0 victory, with Atletico 500/1 to be crowned champions of Spain this season.